Global Autoshop carry full line of Eibach products, please contact us for more information. - Lowers Vehicle 1.75" to 2.25"
- Lower Vehicle 1.0" to 1.5"
To maiximize your Eibach PRO KIT spring upgrade, compliment them with our top quality PRO-DAMPERS. Valved specifically for our PRO-KIT. Eibach PRO DAMPERS take full advantage of the increased spring rate and vehicle's lower center of gravity. This gives you additional performance throughout the suspension's entire working range. The result is a total suspension system created to work together in perfect harmony. 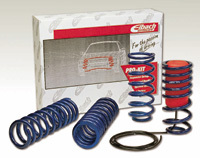 Complete your suspension upgrade with an Eibach ANTI ROLL KIT. While our PRO KIT and SPORTLINE springs sets are regarded as the major suspension tuning of the vehicle's handling characteristics. You will appreciate the added stability next time you dive into your favorite hairpin. During hard cornering your steering alignment will change due to chassis flex. The Eibach PRO CONTROL KIT greatly reduce chassis flex by linking the tops of your vehicle strut towers and chassis locations together. This increased rigidity insurer maximum streering response and the ultimate in precise handling. 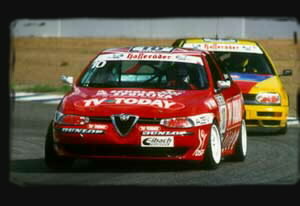 The ultimate test of great suspension is not on the street but on the race track. The Eibach ROAD RACE kits are designed for closed course racing enthusiasts who participate in Club or SCCA Solo 1 or Solo 2 events where OEM springs perches must be retained. With little or no performance modifications permitted, suspension choice becomes very critical - for that extra edge over the competition. 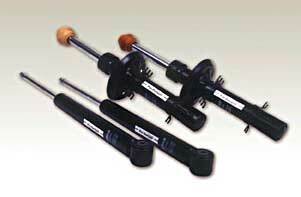 When combined with sport tuned dampers, these springs provide an unbeatable combination. Our DRAG LAUNCH kits are designed by Eibach "Springmeisters" to do just one thing: provide maximum traction to the drive wheels, front or rear, Import or Domestic. 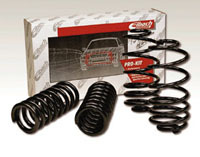 Engineered with the same attention to quality as Eibach product, these special springs lower ¼ mile times dramatically.